January 14, 2015 – With Rye whiskey booming in popularity, Jim Beam is re-launching its namesake Rye with a return to what the company describes as one of the Beam family’s oldest recipes – and a new name. Jim Beam Pre-Prohibition Style Rye Whiskey will replace the current Jim Beam Rye in retail and on-premise accounts starting this month, with a recommended retail price of $22.99 per 750ml bottle. 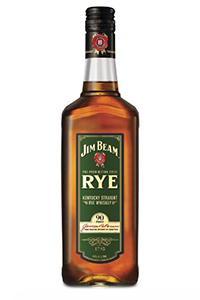 Unlike the current version of Jim Beam Rye, the new version is bottled at 45% ABV (90 Proof). In a news release announcing the change, Beam’s Fred Noe said the Pre-Prohibition Rye will have more flavor than the original. “We’ve heard loud and clear from bartenders and whiskey fans that they are looking for a bolder Rye that stands up better in cocktails,” Noe said. The new version will also have updated packaging, complete with a new green label to distinguish it from the current Jim Beam Rye. Tasting notes will be available at a future date.